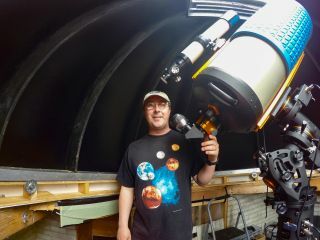 Tim Doucette, who has about 10 percent of the typical visual abilities, is an amateur astronomer and co-founder of an observatory that caters to people with different visual abilities. Tim Doucette was born with congenital cataracts, rendering him totally blind. He underwent numerous surgeries before he turned 20 to remove the lenses of eyes as well as scar tissue. A side effect of the surgeries was that his pupils were permanently dilated. He now has 10 percent of what is considered typical vision. Doucette is also the co-founder of an observatory in Quinan, Nova Scotia, that caters to a wide range of visual abilities. The observatory is a short walk from the Doucettes' backyard, and on the land of one of their relatives. "This sort of observatory was supposed to be a retirement project," Tim Doucette told Space.com. "I could see it materialize when we had plans to move here [two years ago], so it was pretty exciting." Doucette said he wants his visitors to leave the observatory with a better appreciation of the Earth and humanity's place in the cosmos. He also has made it his mission to bring that love of astronomy to anyone, even if they have a visual disability, he said. The observatory built and operated by Tim Doucette and his wife, where they cater to people with a range of visual abilities. Surprisingly, Doucette's vision impairments have given him a unique advantage in pursuing amateur astronomy. Unlike most people, he can see in ultraviolet light, since the lens of the human eye filters that kind of light and his lenses were removed. "For example, the Ring Nebula — some people look at that and see the ring part of it and maybe one of the stars in the middle," he said, adding that he can see more detail. Doucette provides "astro-tours" to people who visit the observatory, and said he can customize the tours for many visual disabilities. When he used to live in Moncton, New Brunswick, in Canada, he once hosted an astronomy session for the Canadian National Institute for the Blind. One of the visitors had very low vision and could see only black and white, so Doucette suggested the man look at the moon. The visitor was able to see the moon's craters, which he recognized from his youth. "It was quite emotional, and a good feeling to help him out," Doucette said. Most of Doucette's visitors find information about him online, but he has also received referrals from the Royal Astronomical Society of Canada, the Tourism Industry Association of Nova Scotia and the Starlight Foundation. Doucette operates the observatory year-round, for half of each month, when the moon is at its darkest. He takes care of doing the tours and showing guests astronomical objects, while his wife provides snacks. Even when winter temperatures outside dip to -4 degrees Fahrenheit (-20 degrees Celsius), Doucette assures visitors that body heat from 10 people will keep the dome toasty for a while, even with the top open. Sometimes, the Doucettes will have bigger groups on site if there is something extra to see. An example was the Perseids meteor shower, when some people watched the show outside the dome while others stayed inside to look through the telescope. Doucette said he is already thinking about next tourism season. "We're looking at having kind of a sleeping-under-the-stars experience. People are looking for a place to camp and spend the whole night under the stars." He said he also plans to offer more alternatives when cloudy nights arise, and perhaps one day add on to his small dome so that more people can use the telescope. For more information about the Doucettes and the observatory, visit http://www.deepskyeye.com/.